An arrangement of March of the Priests from The Magic Flute (K620 - 1791) by Wolfgang Amadeus Mozart (1756 - 1791). The premiere performance of The Magic Flute was on 30 September 1791 in Vienna, under the direction of the composer. Within months of his conducting this first performance Mozart was dead, aged just 35. It has been said that the theme of March of the Priests may have inspired Calixa Lavallée's music for the Canadian national anthem "O Canada". Massed ringing masterclass selection Lancaster University 1985, 2nd Scottish Handbell Festival 1987, and Liverpool University 1999. The music was composed to celebrate what would have been the Golden (Latin "Aurumque") and Pearl (Latin "Margareta") wedding anniversaries of grandparents and parents respectively. However my grandfather died in the months preceding the date of the Golden Wedding anniversary and so the title had the addition of Carmen Sollemne (Latin for sad song). Click play below to listen to a recording of Margareta Aurumque. Appropriate for meditative reading of Charles Wesley hymn text "Love Divine, all loves excelling". Commissioned for the director of Maghull Parish Ringers, Merseyside. Click play below to listen to a recording of Meditation on Blaenwern. “Morning has broken” became part of popular culture when recorded by Cat Stevens in 1971. This setting of the popular traditional Scottish Gaelic lullaby “Bunessan” is suitable for performing in a concert situation or in a worship setting as an aid to meditative reading of the text of the hymn text “Morning has Broken” or the Christmas hymn text “Child in the Manger”. 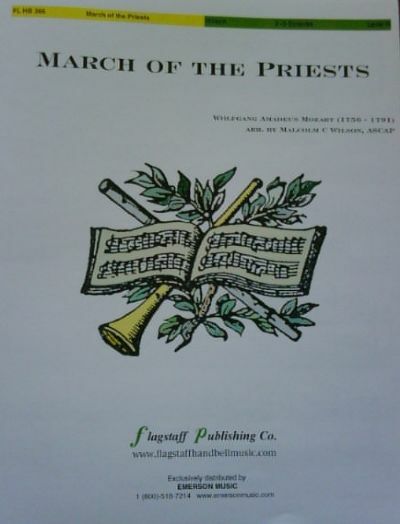 The melody was first published in “Songs and Hymns of the Gael” in 1888. This arrangement is in a reflective style to evoke the tranquility of the village of Bunessan (which gave the melody its name) on the Ross of Mull (Ross means peninsula) at the south of the isle of Mull off the west coast of Scotland. This is inextricably linked to Iona, the island which has been a place of pilgrimage for Christians since St Columba landed there in the 6th century AD, and more recently home to the Iona Community. The setting makes judicious use of handbell techniques Echo, Martellato Lift , Tower Swing), and Vibrato, and intersperses an original motif with the well-known melody. Click play below to see and hear a performance of Morning has Broken by Celtic Carillon, Scotland's national handbell ensemble. My Love is Like a Red, Red Rose, 2-3 octaves, level 1, 2009, From The Top Music, in collection "Celtic Reflections - Three Scottish Folk Tunes", 20204. Robert Burns (1759-1796), wrote the poem "my Love is like a Red, Red, Rose" in 1794 and it was first published in 1797. Incorporates the melodies "Noel Nouvelet", "Personent Hodie" and "Il est ne, le divin Enfant". Ranked within top 40 of retail sales for 1995, Jeffers Retail Division. Click play below to listen to a recording of A Nativity Antiphonal. Commissioned by the Otley Bell Orchestra, Otley, West Yorkshire. There are three motifs. One, the stately refrain, alludes to the classical style of Thomas Chippendale (1718-79), English furniture designer born in Otley. The next provides a carnival feeling as Otley is a market town with an annual carnival. The last theme is hymn-like in reference to the association of the area with John Wesley (1703-91), evangelist, founder of Methodism and publisher of the first hymn book in the USA. Click play below to listen to a recording of Otley.